"Love a good road trip"
The Matilda Way is one road that most definitely leads to adventure, and a different one each day. 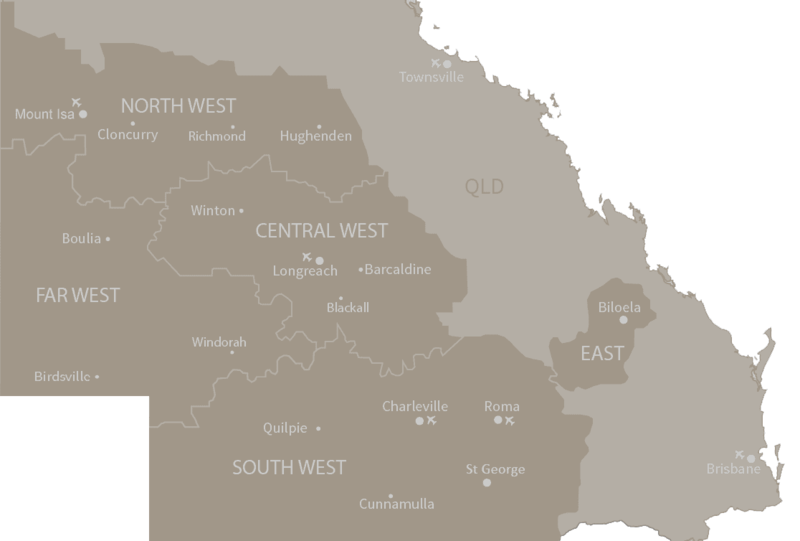 The fully sealed 1812 kilometre highway stretches from the New South Wales border all the way to the Gulf of Carpentaria, from Cunnamulla to Karumba. Traversing the ‘real outback’ the route is filled with friendly local characters, unique attractions and unspoiled natural sites. Four days is a comfortable drive, depending on how long you spend discovering the unique charms of each township. Along the Matilda Way you will discover little known secrets, experience the raw history of the region and natural wonders of the vast and ancient landscapes. 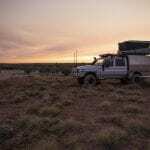 As you’re travelling, check the byways along the route; there are plenty of side-trips that add to the overall outback experience. Just remember you are sharing the road with huge road trains, livestock and native animals, take care and give way, you’ll protect your vehicle and the truckies will thank you for it. Come and enjoy experiencing the Outback along the Matilda Way. Highlight: Goodbye New South Wales, hello Queensland! 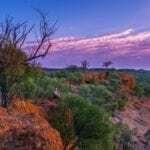 Start your Matilda adventure in Cunnamulla, just 119 kilometres north of the NSW border. 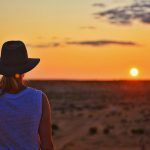 Cunnamulla is a community who invites you to come along and uncover all the hidden gems on offer. Be immersed in the local culture and history as you explore the heritage trail or visit one of the station stays in the region. Visit the Cunnamulla Fella Centres Artesian Time Tunnel and learn a little about the Great Artesian Basin, an underground water table that sustains life in some of Australia’s harshest environments. If nature is your thing take a walk along the Warrego river walk, stroll around the Cunnamulla Bushlands or spend some time discovering some of the 207 bird species at ‘Bowra Sanctuary’. Want to explore more of the south? A bit further up the Matilda Way is Wyandra, 97 kilometres to the north. The highway follows the route of the railway and it’s the railway system that actually dictated where towns would be created. Wyandra, once a major water stop for steam engines that hauled wool and sheep to the marketplace. 100 clicks up the track and you’ll get to Charleville. Now, Charleville is a town that is worth some serious attention, with a history featuring early cameleers, Cobb & Co and Qantas. It has one of Queensland’s largest ‘School of Distance Education’ facilities and is a major base for the Royal Flying Doctor Service, servicing towns as far as Birdsville in the state’s far south-west. Experience the Secrets of Charleville by booking on the Top Secret WWII Tour and discovering what 3500 USAAF personnel were doing here from 1942- 1946 or book into the Charleville Cosmos Centre and Observatory. Marvel at the amazing night sky like you have never seen before. You can also view the Sun through a special Hydrogen Alpha telescope. Astronomy by Day interactive area is very popular with children, including short films, meteorites and interactive displays all to do with the space around us. Why not side trip along the Barcoo Way? Blackall is ‘home of the original black stump’. Heed not what other states claim, as locals descended from early identities such as Jackie Howe steadfastly stick to the belief that the stump located in Thistle St is the genuine article. In 1892 Jackie set a world record by shearing 321 sheep in seven hours and 40 minutes. He held that record for 58 years and when it was finally broken it was only by a shearer using machine shears, which were unheard of in Jackie’s era. It’s here that you will again greet the Barcoo River, which flows close to the town. Keep count of how many times you cross the Barcoo on this trip, as local legend has it that after the tenth crossing you’re there to stay. Barcaldine is an attractive town steeped in history and culture with plenty to see and do – an overnight stay is recommended. The best place to begin is the Visitor Information Centre in The Globe where the friendly staff will tell you all about the town. You can also visit the History Room and the Art Gallery which are located in the building. On Oak Street, the famous Tree of Knowledge celebrates Barcaldine’s fighting spirit and connections to Australia’s labour movement. The monument has a cathedral feel and is particularly beautiful at night when lit by special lighting. Packed with local history, the Australian Workers Heritage Centre is well worth a visit. If you’re travelling between Barcaldine and Ilfracombe during August to September, spectacular wildflowers (in season) are a must see and the many species of birds will appeal to bird watchers. In Ilfracombe, old tractors, disused farm equipment and historic rural machinery have been neatly laid out, forming an open-air museum known as ‘machinery mile’. Wander around town and visit the Wellshot hotel, take a dip in the artesian spa, the corrugated iron Langenbaker Cottage and Post Office, which claims to have been Australia’s first motorised mail service. The bustling town of Longreach came into prominence for visitors in 1988 when the Queen opened the Australian Stockman’s Hall of Fame. This modern centre is world famous and warrants much more than just a casual glance. The entire history, adventure and essence of the Australian outback is rolled into one huge, diverse and informative display. Adding life to this western Queensland town are a number of other first-class attractions, namely the Qantas Founders Museum, with its own decommissioned Boeing 747 Jet as its centrepiece. The School of Distance Education offers tours of its facility, which provides an education to students within a 1000 kilometre or more radius via satellite internet. The Longreach Pastoral College, the Longreach Power House Museum and the Longreach Arts and Cultural Centre, in the old Ambulance Station, where locals display their arts and crafts, are also worth a visit. The big skies and wide open spaces around Winton have excited and inspired visitors for years. Banjo Paterson wrote Waltzing Matilda in the neighbourhood back in 1895. The song was performed in public for the first time at Winton’s historic North Gregory Hotel and now it is sung wherever Australian’s gather to celebrate. The new Waltzing Matilda Centre, dedicated to the memory of Waltzing Matilda, opened with a gala event in March, 2018. Cloncurry is 348 kilometres on from Winton, but a side trip to discover the Combo Waterhole just south of Kynuna is well worth the trip. The waterhole Banjo Paterson drew inspiration from for the national folk song Waltzing Matilda. 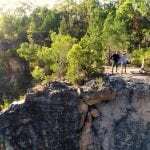 Walk the 2.5 kilometre return circuit to the billabong along the Diamantina River and have a picnic “under the shade of a Coolibah tree“. Hitting the road again, it is a short trip to Mckinlay where you can test another watering hole, the Walkabout Creek Hotel, the pub made famous by Paul Hogan in his movie “Crocodile Dundee”. The pub, together with other buildings in the town were featured in this iconic Australian film. A visit to John Flynn Place Museum and Art Gallery will provide a history lesson or two. Commemorating Reverend John Flynn who developed the Royal Flying Doctor service as a ‘mantle of safety’ back in 1928. Covering isolated regions the service is still as integral to the outback’s survival today as it ever was. Continuing on to Normanton, the vista changes and you’ll see taller and taller termite mounds, which is a sure sign you’ve reached north-west Queensland. It’s a good stretch of road extending the 71 kilometres to Karumba, a town right on the Gulf of Carpentaria. Although it seems to take the longest of any previously travelled section of the highway, it’s all to do with the excitement of finally reaching the ‘end of the road’ and the Gulf of Carpentaria. Its very location makes Karumba an excellent place to get a ‘feed’ of fresh seafood including excellent prawns, for which the town is noted. Visit one of the many vibrant bars at night and you’re sure to run into somebody from the prawn trawling fleet. Speaking of bars, music buffs may know the Red Hot Chill Peppers’ song ‘Animal Bar’, from the album Stadium Arcadium, which is written about Karumba and named after one of the town’s bars. Around Karumba it’s relatively flat country, but it’s the birdlife that excites. Saurus cranes, similar to a brolga, are in abundance. If you’re in Karumba in September or October, keep an eye out for the ‘morning glory’ a unique cloud formation that sometimes forms in the early morning. Congratulations for making the full length of the Matilda Highway.